Most low cost touch screen applications use a 4-wire resistive touch screen. 4 wire resistive touch is typically glass bottom and film top, but they can be film + Film. 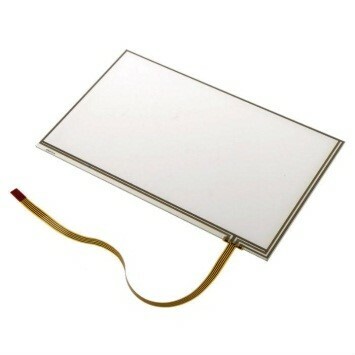 It consists of a conductive bottom layer of either glass or film and a conductive top film layer, separated by extremely small, transparent spacer dots. A voltage is applied across the conductive surface. When pressure from a touch is applied to the top layer, it is compressed and makes contact with the bottom layer resulting in a voltage drop. This change is detected by the controller. By alternating the voltage signal between the top layer and the bottom layer, the X and Y coordinates of the user’s touch are computed. Each layer serves as one of the axes. No ITO patterning is required so costs remain lower.